It seems like we might expect velars to be most commonly ejective if this process is optional, since intraoral pressure will be highest for glottalized dorsals. Thus if the ejective release is somewhat accidental (a physical consequence of high pressure buildup between the glottis and the oral constriction), it would make sense that /k/ would more often get released as an ejective than /t/ or /p/. Forty years ago, I'd just been giving a talk with lecture style delivery to a large group of Russian teachers of English — most of whom had seldom or never heard a native speaker. One of the teachers came up to me and asked whether bʌts had now become common in English speech. Eventually I worked out that I must have said But with particular emphasis before a pause (with the same intonation I would have used for However. The sound the Russian lady heard as s must have been the ejective release of a glottalised t.
This makes sense. I always thought ejectives were fearsome from the descriptions in books, and it didn't get better when watching the physiological acrobtics of people imitating them. Then during a visit to the Caucasus I suddenly felt at home. It occurred to me then that there might be reduced forms of ejectives that overlapped the glotalized stops of English. My impression is that you can't move for ejective /k/s in the UK media. I'm always on the lookout for a word internal ejective, but have yet to hear one. Non utterance final doesn't seem too uncommon, though. I don't think I claimed it was recent, merely that I hadn't noticed it particularly until about twenty years ago - probably because I wasn't being very observant. I'd also heard it from Lionel Jeffries in the film "Chitty Chitty Bang Bang" from 1968, so ejectives date from some time before that as well. Is "at least forty years" recent? The upsurge in SSBE ejectives (which I started to notice about 10 years ago) is surely different from both the north-country feature mentioned by Cruttenden and the stylistic feature of hyper formal or 'proper' speech, which Lionel Jeffries may have used as Grandpa Potts. For many younger speakers ejective k seems to be the pre-pausal default, requiring no 'appropriate stylistic conditions', and like Paul Carley I hear it increasingly within utterances. Last week I heard a pop singer use one in the middle of a musical phrase. I'm sure John is right to link this to glottal reinforcement, and I suspect that the increase of full t-glottaling in SSBE played a role. Final voiceless stops became less distinct from each other perceptually, and ejective k fortition counteracts this. On SCEP this year I noticed Tim Wharton using ejective k, t and p pre-pausally in lectures. Perhaps ejective t and p still require more of a stylistic fillip. I have certainly noticed - and the impression is unprompted by this blog post - that ejectives are becoming more common in BrE. I agree also that ejective /k/ is more common than the others and that ejectives are, certainly normally and perhaps invariably, prepausal - I had indeed assumed that the ejective was a Grenzsignal. I divide my time between the north and the south and am not sure whether the phenomenon is more common in one region or the other: certainly I will now listen out for evidence one way or the other. So its common[ish] in brEng... what about amEng? I just became concious of my use of ejectives esp. /k/. curious if its at all widespread here in california, esp if connected to t-glottaling which is fairly common here. relatedly, ive met other english speakers who turn the /k/ in into [q] interestingly enough. Listen to kʼinda at around 1:56 and like at around 2:02. As I know he's from Seatle. The Second one is a perfect ejective but I'm not sure how to categorize the first one. "Ejective variants of word-final stops are common (typically /k/, especially after /"ng" /, but /p/ and /t/ and even ejective variants of /bdg/ have been systematically observed in both adult and child speech). The appearance of ejectives is highly influenced by sentence prosody: with phrase-final ejectives being most frequent; although they also occur in nonfinal phrasal positions (Gordeeva & Scobbie, 2006 = below). Ejective realisation seems to be a distinct type of stop glottalisation in a hyper-articulated mode of communication, which additionally reinforces the place and manner of articulation of the stops." However, one angle that is more complex than you think we might expect, is that there may be a social differentiation of class in Scotland. I say this because ejectives appear in our ECB08 teenager corpus  in some middle class kids, not working class. We know already that WC final stops are MORE glottalised or can be plain glottal stops - almost categorically. So it's not as simple as saying that loss of burst information if there is heavy glottalisation leads to ejectives. Ejectives appear more, I think, in the speech of those who glottalise less. Still to be investigated. However, I have also heard some fairly broad speakers using ejectives - got a couple of clips from the radio that I use in teaching, captured in 2006, which are very like the nice video interview posted above - two ejectives in a Scottish MSP saying he is a "punk at heart" exemplifies a phrase-internal use. And a young girl in "it was, like, really good". The presence of an ejective gives me an IMPRESSION of discontinuity from the surrounding phrase, i.e. that is signals a boundary, but that's a chicken-and-egg thing I suspect. Hence the "like" is quite well integrated but really stands out. various work appearing from ECB08 on articulation of /r/ and /u/, with Jane Stuart-Smith and Eleanor Lawson. Hope this isn't too academic for a Blog! 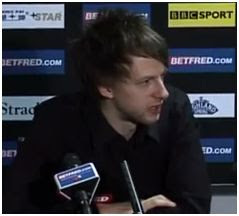 I've just heard an interview with Judd Trump on BBC2. His accent has changed, he now sounds like an Afro-Caribbean Londoner. Weird.